The River of Ziamonds 1 Carat Round Cubic Zirconia Suspended Pave Solitaire Engagement Ring features a 1 carat 6.5mm round solitaire that is set with integrated prongs that flow up from the shank. The round cubic zirconia center stone is elevated to look like a bridge above a running river of pave set round cubic zirconia. 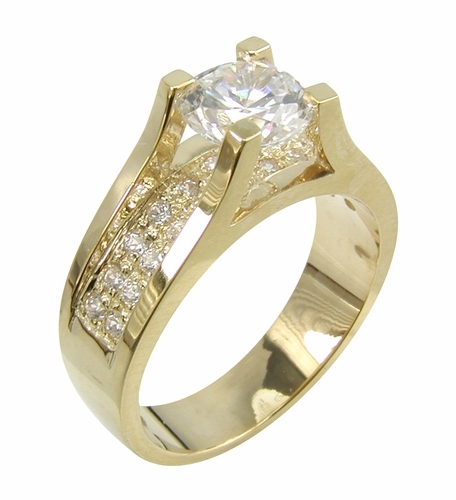 The total carat weight is approximately 2 carats in total carat weight. The band measures approximately 6mm at its widest point. All Ziamond cubic zirconia includes a lifetime warranty and is hand cut and hand polished to exact diamond specifications from the original Russian formula. Due to extremely low pricing, all clearance sales are final. Clearance items are stocked in a certain finger size(s) and may be sized for an additional fee. Please see menu options. Sizes below a 5 or above an 8 can be made via Special Order. 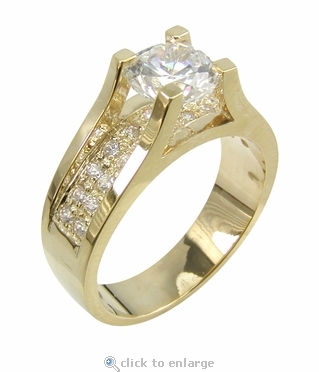 Please call 1-866-ZIAMOND for a quote or contact us via live chat and speak with a knowledgeable representative.